Since its inception, 800 Degrees has been serving up delicious Neapolitan Pizza under the leadership of founder Chef Anthony Carron. Born out of Chef Carron’s desire to bring back quality to the American staple that is pizza, 800 Degrees focuses on using premiere ingredients, as well as creating an esthetically pleasing environment to dine in. The result is a chic and delicious, fast dining experience. And while the pizza on its own is incredible, 800 Degrees is revamping its locations all across the globe with an upgraded menu. What was once 800 Degrees Pizzeria is now becoming 800 Degrees Woodfired Kitchen. And let me tell you, this expanded menu is absolute fire! Of course, definitely still order a classic Neapolitan Pizza; they put 800 Degrees on the map for a reason. But some new menu highlights include the burrata, salads, power bowls, sandwiches, rotisserie chicken, and wide variety of appetizers. Of the burrata, my favorite is the Proscuitto & Strawberries. It comes served with warm ciabatta bread, too. The burrata is so creamy, and the savory prosciutto combined with the sweet berries is so wonderful. The whole thing just melts in your mouth. I am a big fan of Shishito Peppers, and 800 Degrees’ did not dissapoint. Both the portion and the peppers themselves were so generously sized. Perfect for sharing with a group of friends before your pizza. Now for the Power Bowls…I am honestly lucky that I do not live right next to an 800 Degrees, because if I did, I think I would end up spending all my money on the Power Bowls. Served with quinoa, corn, cucumbers, avocado, and Tahini dressing, these bowls are so healthy, so filling, and so darn good! 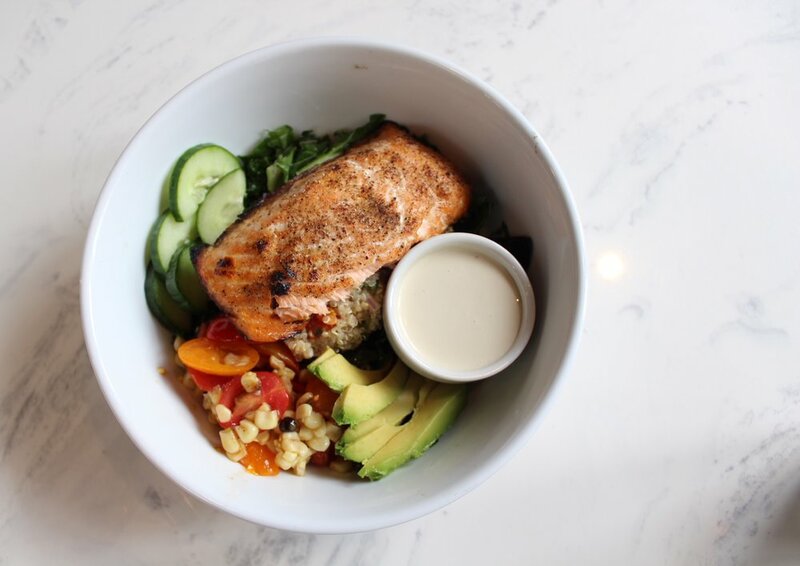 I got mine with Salmon, but I have been told the rotisserie chicken bowl is also outstanding. 800 Degrees is the perfect place to come when you are looking for the quality of a fine-dining experience, but just don’t have the time or desire to spend lots of money. I highly recommend you stop into the Hollywood or Downtown LA locations to experience the woodfired kitchen for yourself. I promise you won’t be disappointed.